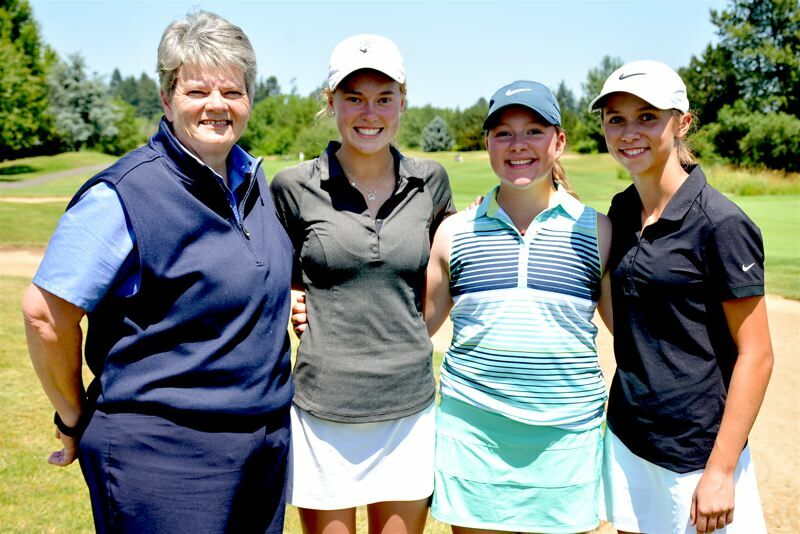 When she played for the Tigard High School girls golf squad, Victoria Gailey always seemed to be a team player. Well, while playing for the Oregon team in the 2018 Juniors Americas Cup, Gailey once again was a team player. And, this time, she helped lead the Oregon squad to a strong placing. The Oregon team, with Gailey pacing the squad, battled its way to sixth place at the 18-team event held July 25-27 at the Hiwan Golf Club, located in Evergreen, Colo.
Oregon, coached by Shandra Imlay, for the three-round tournament, had a team score of 681 strokes (51 over par). That put the Oregon squad just six strokes behind fifth-place Colorado. Mexico took first place with a 12-over-par score of 642. Oregon, in the July 27 third round, had a team score of 221, which was third best among all teams for the day. Gailey, a 2018 Tigard High School graduate, led the way for Oregon in the tournament, with a three-round individual score of 225 (15 over par). That put her in a tie for 12th place in the final individual standings. Gailey opened play on July 25 with a score of 75, in a round that included a pair of birdies. On July 26, she carded a 76, which was best for the team for the day. She finished play on July 27 with a round of 74. Mary Scott Wolfe, a Jesuit High School junior-to-be, had a three-day score of 226, which put her in a tie for 14th place in the individual standings. Scott opened the tournament with a 74 in the first round of play. She carded a 78 in the second round and then finished up with another 74 in the final round. Olivia Venderby, a West Linn High School junior-to-be, had a three-round score of 235, which put her in a tie for 34th place in the final individual standings. Venderby had 76 in the opening round, but struggled to an 83 in the second round. But she rebounded in a big way, carding a team-best 73 in the final round. Olivia Loberg, a Summit High School senior-to-be, had a three-day score of 236, which put her in a tie for 37th place in the final individual standings. Loberg shot a 76 to open play at the tournament. She shot an 81 in the second round and then finished up with a score of 79 in the third round. Cory Lopez, from the victorious Mexico team, was the individual medalist for the tournament with a three-round score of 212. Prior to the 2018 Juniors Americas Cup, Gailey triumphed at the 21st Oregon Junior Stroke Play Championships. Gailey will begin playing for the University of Nevada this fall. The Wolfpack's first tournament of the season will be the Ptarmigan Ram Classic, which will be held Sept. 17-19 at the Ptarmigan Country Club in Fort Collins, Colo.